From the iconic Aquaracer collection by luxury watchmaker TAG Heuer, this exquisite Swiss Made timepiece features a brushed and polished stainless steel case and bracelet, stylish mother of white dial with luminescent markers, date aperture, classic logo branding and 300m water resistance. 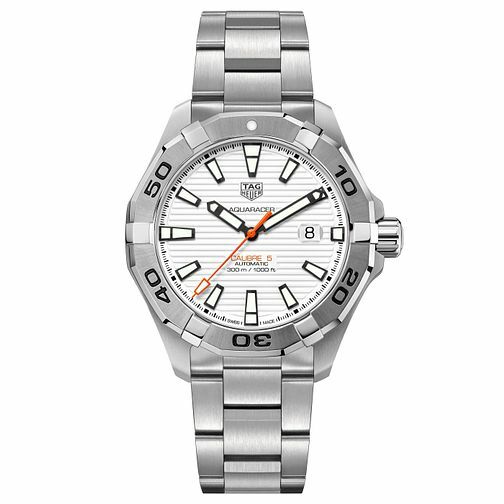 TAG Heuer Aquaracer Men's Stainless Steel Bracelet Watch is rated 4.0 out of 5 by 1. Rated 4 out of 5 by Anonymous from 4 Stars This watch feels very genuine on the wrist and does not feel cheap at all. I especailly like the date zoom. Also, the loom is extremely bright. Heaver than I expected but I like a heavy watch. The only bad point would be the divers extension - the materail does not seem to be of high quality, looks like something you would find on a £500 watch. Other than that not a bad purchase.